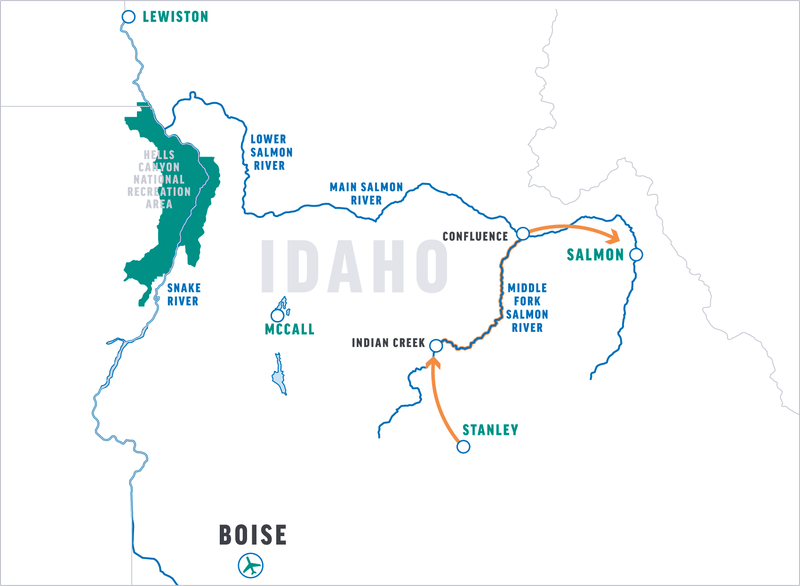 Idaho’s rivers access some of the most pristine terrain in all the state. They are home to abundant flora and fauna, an impressive network of hiking trails, and some of the country’s best whitewater. Of all the rivers that flow through Idaho, perhaps the most spectacular is the Middle Fork of the Wild and Scenic Salmon River. Considered the state’s “Blue Ribbon” river, the Middle Fork Salmon boasts non-stop, Class III-IV whitewater, natural hot springs, and excellent fishing. And then there’s the scenery—soft meadows that roll towards the base of soaring mountains, craggy canyons ribboned with waterfalls, deep green forests, and grassy hills dotted with wildflowers—the diversity and beauty of the Middle Fork is stunning. Join OARS and see how good a river vacation on this breathtaking waterway can be. We’ll meet at 8:00 PM at the Mountain Village Resort for a pre-trip meeting. This is an opportunity to meet your fellow travelers and trip leader and ask any last-minute questions. Your trip leader will give you a thorough trip orientation, pass out waterproof river bags so you can pack your belongings that evening, and confirm the meeting time for the following morning. We’ll take a scenic flight to our put-in at Indian Creek, where your boats and crew await you. (At certain water levels, we may be lucky enough to put in further upstream at Boundary Creek, which we access by ground shuttle. The trip will start there whenever possible.) After an informative safety talk and paddle raft/inflatable kayak instruction, we take to the pure waters of the breathtaking Middle Fork. Within moments, you’ll experience your first rapid, an appropriate introduction to this river whose exciting, consistent whitewater doesn’t stop until its confluence with the Main Salmon. Our high-elevation put-in point rewards us with fantastic alpine scenery, and we spend our first day among deep green forests, dramatic mountains, and crystal clear creeks that pour out of the woods and into the river. The first day generally sets the pace for our week on the river. Typically, we spend a few hours on the water in the morning, sometimes stopping for a great hike, a visit to a waterfall or an Indian pictograph, or a soak in a natural hot spring. Come lunchtime, we pull over to a sandy beach and enjoy a delicious picnic. After feasting and relaxing on the beach (or perhaps swimming, a game of Frisbee, a nature walk…), we get back into our boats for more exciting whitewater. Be sure to try your hand at the paddleboat and inflatable kayak! Mid- to late-afternoon, we stop and make camp; you’ll grab your bags and set up your tent while we take care of the kitchen and “living room”—camp chairs and the site for tonight’s campfire (if permitted). Read, nap, or just sit back and laugh with friends and family as we prepare dinner. After a satisfying feast, the evening is yours to spend however you wish. Maybe music, stories, or jokes will bring us together tonight; maybe the popping of the fire, the whisper of the river and the clarity of the big, star-filled sky will encourage silent reflection on the amazing wilderness that is, for now, our home. Toward the end of our voyage, the Middle Fork rushes into Impassable Canyon, a narrow gorge that creates some of the most high-intensity and continuous whitewater of the trip. Paddle hard through Redside, Rubber, and Hancock rapids and enjoy the sudden spectacular change in scenery from wooded hills to the sheer granite walls and huge boulders of Impassable Canyon. On Day 6, we reach our take-out at the confluence with the Main Salmon for your transport back to Salmon. Our journey has ended, but we’re sure that although you leave the river, the river will never leave you. We’ll meet at 8:00 PM in the conference room of the Mountain Village Resort for a pre-trip meeting. This is an opportunity to meet your fellow travelers and trip leader and ask any last-minute questions. Your trip leader will give you a thorough trip orientation, pass out waterproof river bags so that you can pack your belongings that evening, and confirm the meeting time for the following morning. Please note: When booking your flights, be sure you arrive in Stanley the day before your trip starts. You will need to arrive in Boise no later than 3:00 PM as the last flight from Boise to Stanley generally departs at 4:30PM. When your trip ends, OARS will provide land transportation back to the town of Salmon, with arrival between 4:00 and 6:00 PM. Plan to spend that night in Salmon. Gem Air will begin return flights to Boise the next morning. For your connecting flight home, we recommend booking your departure from Boise at 11:00 AM or later. To arrange your flights, please contact Gem Air on (208) 756-7382. Please mention you are an OARS guest when making your reservation. If you experience a delay on the way to Boise, please call Gem Air on (208) 756-7382. You may also call this number if there is no one at the check-in desk in Boise when you arrive. For transportation from the airstrip in Stanley to the Mountain Village Resort, please use the phone at the airstrip to call Mountain Village Resort, and a complimentary shuttle will come and pick you up. The Stagecoach Inn in Salmon, where you will be dropped off at the end of your trip, also provides a complimentary shuttle from their motel to the airstrip in Salmon. Please let the reception desk know when you check in that you will need a shuttle the next morning to the airstrip. Please note: If you drive, you will need your car transferred from the meeting point in Stanley to the end point in Salmon. To arrange a car shuttle you may contact Caldwell Transportation at 208 774 2265. They will deliver your car to the Stagecoach Inn in Salmon to wait for your return. The cost of this shuttle is approximately $110. A coach service is available between Boise and Stanley departing the Boise airport at 4:00 PM with an arrival in Stanley at approximately 7:00 PM. Reservations are required. Please call the Caldwell Transportation Company (www.ctcbus.com) at (800) 727-9925 for additional information and reservations. The cost for this service is approximately $105 per person. Please note: During the high-water season, use of inflatable kayaks will be at the guides’ discretion based on safety concerns. As dinner is being prepared by the guides you will have an opportunity to relax, enjoy a drink if you wish, and reflect on the day with your fellow traveling companions. We provide a limited supply of soft drinks, water, lemonade and a small supply of beer and wine with dinner. You are welcome to bring your own favorite beverages, alcoholic or non-alcoholic, in non-glass containers. If you choose to bring additional drinks or alcoholic beverages, please let us know in advance. For those planning to buy hard liquor in Idaho, State Liquor Store hours vary. For information on where you can buy liquor in Idaho, please visit: http://www.mixblendenjoy.com/ . Selection is likely to be limited. For your safety and the safety of others, the consumption of alcoholic beverages is limited to camp. The Middle Fork of the Salmon has many great hiking trails. While we generally plan at least two guided hikes on each trip, there is ample opportunity for the curious to explore the area at length. Please let your trip leader know if you are an avid hiker and remember to bring extra water bottles and good shoes. Remember, however, that all hikes are optional and you can choose to lie on the beach and take in a few tanning rays or read a book instead. Late May, June, and September Trips: These are surely some of the most beautiful months to be on the Middle Fork of the Salmon River, but they can also produce some surprisingly chilly times. During the fall, the sun is not far enough north in the sky for its warming rays to reach down into the river canyon for as many hours a day as it does in the summer. This means more shady areas, fewer sunny ones. Therefore, when you are splashed (drenched) going through the rapids and you’re in a shady area, you will get very cold unless you are prepared. We supply a professionally laundered sleeping bag with a liner, a pillow with freshly laundered pillowcase, a sleeping pad, a ground tarp as well as a shared tent. The complete customized sleep kit that we provide is designed for your comfort and maximizes available luggage space. Our sleeping bags are degree rated depending on the season and are 33” x 84,” which is longer than the normal (80”). At the pre-trip meeting each person will be given one large waterproof bag (approximate sealed size: 13” diameter x 25” tall; 3318 cu in; 54.4 L) We also provide a small waterproof bag per person for day use, where you can keep items such as raingear, camera, sunscreen, lip balm, etc. (approximate sealed size: 17” tall x 9” diameter; 1081 cu in; 17.7 L). The bags are cylindrical in shape and pack from the top. Please pack light, and keep in mind that river attire is casual: comfort, convenience and boat space take precedence over style. At the end of the trip, you will return with your waterproof bags, where you will be able to unpack your gear before your trip home. If you have extra luggage it should be locked in your car. You can also choose to bring your gear in a soft sided duffle, which can then be put at the bottom of your waterproof bag. O.A.R.S. Dories, Inc. and cooperating agencies act only in the capacity of agent for the participants in all matters relating to transportation and/or all other related travel services, and assume no responsibility however caused for injury, loss or damage to person or property in connection with any service, including but not limited to that resulting directly or indirectly from acts of God, detention, annoyance, delays and expenses arising from quarantine, strikes, theft, pilferage, force majeure, failure of any means of conveyance to arrive or depart as scheduled, civil disturbances, government restrictions or regulations, and discrepancies or change in transit over which it has no control. Reasonable changes in itinerary may be made where deemed advisable for the comfort and well being of the participants, including cancellation due to water fluctuation, insufficient bookings (this trip requires a minimum of 4 guests- 6 for gourmet, craft beer and wine trips), and other factors. There is risk in whitewater rafting, particularly during high-water conditions. Rafts, dories and kayaks do capsize. You could be swept overboard. Your guide will make every attempt to assist, but you must be strong and agile enough to “self-help” and “float-it-out” without further endangering yourself or others. We reserve the right not to accept passengers weighing more than 260 pounds or with a waist/chest size exceeding 56 inches. We may decide, at any time, to exclude any person or group for any reason we feel is related to the safety of our trips. We are experienced at accommodating people with various disabilities. Please give us an opportunity to make you feel welcome. We need to discuss any special requirements ahead of time. On advancement of deposit the depositor agrees to be bound by the above recited terms and conditions. Prices subject to change without notice.